Top mount radiator - what would I need? From pics I've seen it seems like it would be fairly easy. 1) I'd need to drill enough holes for stand-off screws to hold the radiator suspended in place. 3) Dremel out 2 openings for the in/out H20 tubes to access the RAD. Can anyone shed some light for me or direct me to a site with a guide? I have a steel Thermaltake Armor case and I might have trouble woking with the space at the top of the case but I think I can manage. Do you want an actual stand-off mount (like mine which is the first picture in the case thread.... :) ) or would you prefer a top mount directly attached to the top of the case? (Babr did this with a 240 on his antec case). If you are planning on direct top mount vice a stand off on you just need to cut the top of the case to match the fans you are going to use and then direct the barbs downwards into the case. If you want to do a stand-off mount like I did, I would suggest making the holes for the hoses larger than the hose and then using some form of grommet so that the hose isn't directly in contact with the metal. As far as a guide goes..... Babr did a pretty good build log for his direct top mount, and you might be able to dig my build log up over at DIY-Street (same username.... :) ). I'll check those out those builds. Your standoff model is what I was thinking of for unlimited cool air. From the pics it looks like you used 6 nuts, 6 bolts and 6 spacers to elevate the RAD and keep it in place - Unfortunately I'll have to wait till I have the new H20 stuff in hand before I can seach Home Depot/Canadian Tire for the right hardware. 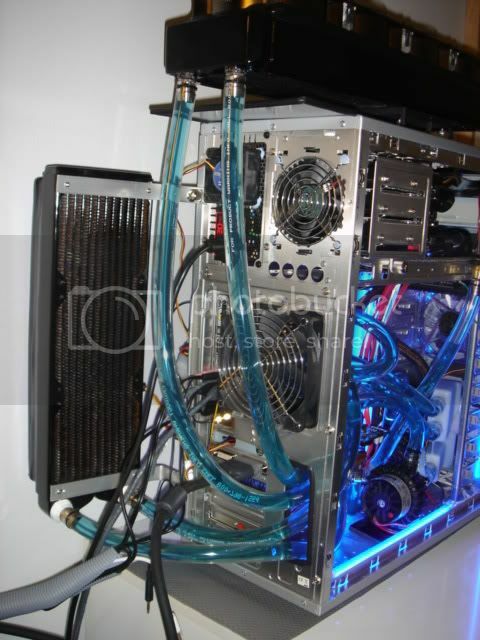 Another question sswilson: I see you use the Thermaltake bigwater - did you use the coolant that came with it? I said in post above it is my first attempt at H20 = almost. I had a TT Bigwater that had multiple problems and the pump died after 24 hours use - but I still have 2 bottles of coolant from that rig. Do you (or anyone else) recommend that I use that coolant in the new H2O I'm building? That is the coolant I used, but I'll let others chime in with that recommendation. There might be an issue with corrosion as each manufacturer claims that you have to use their own "special" formula. (If it were me... I'd use it.... :) ). Depending on what you find for spacers you may want to get large close tolerance washers for under/over them. It'll add a lot more stability. 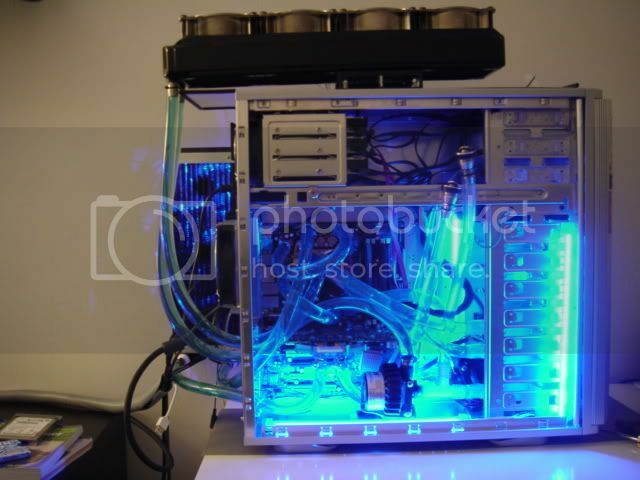 What did you use between the top rad and the top of the case? Not dissin' your build, but it looks like it's only held on with 4 screws/bolts at that point, and that it might benefit from some support at the back. Looks pretty cool though, you're running two full loops right? Its a radbox on top there. Its pretty stable for now but im planning to add another radbox to the left of that one to keep it more stable.